Wondering where are 3d Ultrasounds offered in your area and what exactly these techniques cover? Read on to find the resources you need. As soon as many women find out they are pregnant, they start looking forward to their ultrasounds at the doctor's office. These simple procedures provide images of the baby using a handheld wand that transmits sound waves into the uterus. The images that are created often provide parents and doctors with important information about the baby, including size, gender, and the amount of fluid in the uterus. In some cases, it can also show potential problems, like an undersized baby or organs that may not be fully developed. 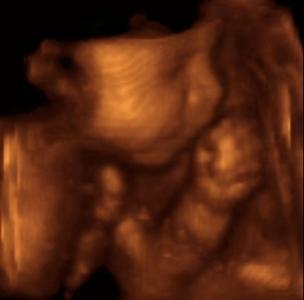 More recently, 3D ultrasounds offer an even clearer image of your baby. Gone are the fuzzy pictures where you have to squint to make out the difference between a knee and an elbow. Instead, you may get to see the facial features of your baby and even take home photos worthy of a frame or scrapbook to share with your child later. These are also sometimes referred to as 4D ultrasounds. Although some hospitals and doctors' offices offer 3d ultrasounds, you will probably need to visit a privately owned facility in your area for this service. Many of these facilities are owned by OB/Gyn practices or are part of several independent franchises that opening across the country. If there isn't one listed here near you, check your phone book for "ultrasound services" or ask your prenatal care provider where are 3D ultrasounds offered in your area. GoldenView Ultrasound: located in Boston and Chicago, this ultrasound provider has three screens in the exam room, including an 82-inch screen that shows every detail of your baby. 4D Fetal Imaging: this center offers evening and weekend appointments in San Jose and San Francisco. Womb With A View: this facility includes packages with CD images, videos, and both color and black-and-white prints of your ultrasounds. Womb with a View currently has four locations in Cherry Hill, N.J., and Lemoyne, Allentown, and Lancaster, Pa.
Looks Who Kicking: for Florida moms-to-be who want a day of pampering with their ultrasound, this provider has optional massages and pedicures available with your visit. Located throughout central Florida, including Orlando and Tampa Bay. Stork Vision: led by two OB/Gyns, Stork Vision has branches in seven states, including Arizona, Georgia, and Oklahoma. Many expecting parents flock to ultrasound providers to get a closer glimpse of their unborn child. It can make moms and dads feel closer to their baby and helps them prepare for the arrival of their child.There are plenty of other reasons parents like this option compared to the standard ultrasound they receive at the doctor's office. For one, you can bring other family members and friends into the exam room with you. In a traditional medical facility, space limitations usually only allow the parents and one other person to attend. Second, since these facilities cater to expecting moms like any other business, they usually offer extended hours in the evenings and weekends and are more flexible with their scheduling. Finally, while a doctor's office may provide parents with a printout of the image, 3D ultrasound providers usually have portrait packages, DVDs, and other keepsakes of your unborn baby. Even after you answer the question "where are 3D Ultrasounds offered? ", there are still some considerations to make before you decide to make an appointment. For starters, these ultrasounds are not covered by insurance since they are not medically necessary, so moms need to pay out-of-pocket. A series of visits over the course of nine months can easily top $1,000. Most basic packages for a one-time visit start around $175. Second, these ultrasounds do not take the place of qualified prenatal care in your doctor's office and cannot be used for diagnostic purposes. If you have any concerns about your baby's health, see your doctor. If you do know that there are medical issues with your child, an ultrasound provider won't be able to provide you with medically reliable information about your baby. Lastly and most importantly, the FDA cautions against the use of 3D ultrasound for non-medical reasons. Although there is currently no data to suggest that the sound waves used in ultrasound cause any damage to the fetus or the mother, there are no studies about the long-term effects of repeated ultrasounds. Because of this, the FDA and many health care professionals do not recommend using ultrasounds outside of the standard care provided by your doctor.